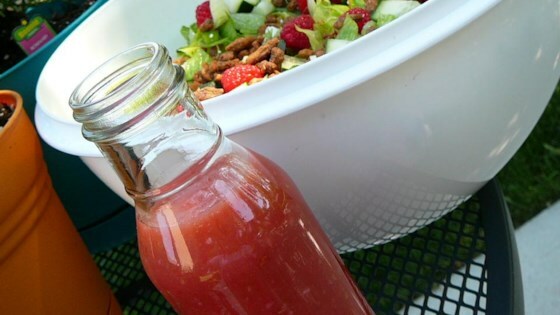 "This is an easy and delicious homemade salad dressing. Keeps for a day in the refrigerator. Great on a salad of spinach leaves, red onion, cherry tomatoes, and toasted sliced almonds." Press raspberries through a fine-mesh sieve using a spoon to remove seeds. Whisk raspberries, rice vinegar, garlic, sugar, sea salt, and white pepper together in a bowl. Slowly drizzle avocado oil into raspberry mixture, whisking rapidly, until dressing is thick and creamy. Let sit until flavors develop, about 10 minutes. See how to make a tangy cranberry and mustard-based vinaigrette. Red-wine vinegar can be used instead of rice vinegar. You can omit the lemon juice and garlic, if desired. You can substitute a dash of stevia for the white sugar, if desired. You can substitute olive oil for the avocado oil. This is such a light and refreshing dressing. It was perfect over spinach with strawberries. I made this for an office luncheon and everyone loved it. Quite tasty. I substituted olive oil for the avocado oil, and used garlic-infused rice vinegar in addition to the one fresh clove. Thanks for this recipe! Yummy! Used olive oil because that’s what I had on hand. It was time consuming to get the raspberry seeds out of the fruit but worth it!